Don’t worry, cherished readers: Matt Hinton, your trusty weekly wrapper, will be back in full force next Monday to take you through everything you need to know about the main events. This weekend, however, Matt joined forces with Grantland’s fellow college football enthusiasts to recap the big Week 1 takeaways, Shootaround-style. Matt Hinton: I’ll admit that when I wrote about Josh Rosen last month as the potential catalyst of a championship season at UCLA, I wasn’t thinking very far beyond the potential. Yes, as true freshman quarterbacks go, Rosen looked like a sure thing: At 6-foot-4, 210 pounds, he boasted the frame of a pocket-passing prodigy and the universal recruiting hype to match. But what does success for a true freshman quarterback really mean? The cold fact is that first-year passers tend to be judged almost exclusively by their capacity for long-term growth, and almost never by what they stand to achieve in their first year on campus. For an outfit with short-term ambition, the track record with rookie starters is grim: No true freshman QB has led his team to (or anywhere near) a national championship since Oklahoma’s Jamelle Holieway in 1985, or to a major conference championship since Michigan’s Chad Henne in 2004. 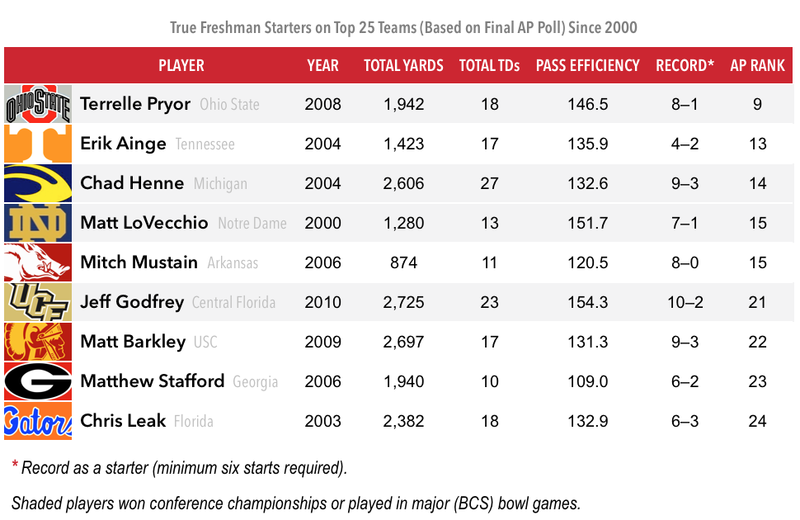 Since the turn of the century, the only team captained primarily by a true freshman even to crack the top 10 in the final AP poll was Ohio State in 2008, behind a very green Terrelle Pryor. And in Rosen’s case, there were red flags, specifically stories about the young phenom coming across as arrogant and difficult, which helped to explain why coach Jim Mora made a point of loudly mocking Rosen in front of reporters covering a preseason practice. That’s one way to describe his collegiate debut in Saturday’s 34-16 win over Virginia: just distributing the ball, with the routine ease of dropping a few pieces of mail into the slot. In all, Rosen successfully distributed the ball to UCLA’s playmakers on 28 of 35 attempts, hitting a dozen different receivers for 351 yards, three touchdowns, zero interceptions, and a 192.5 efficiency rating, second best in the nation against a major-conference opponent in Week 1. Another way to describe it would be revelatory: On a weekend that saw veteran NFL hopefuls looking sloppy and listless in their season openers, and other, equally hyped newcomers looking erratic and overmatched, Rosen came as close as anyone in his position could have conceivably come to exceeding the hype. He was patient in the pocket, in sync with his receivers, and cool under pressure. He got rid of the ball quickly and decisively to the right targets. He fired passes accurately into tight windows and floated them downfield with exquisite touch. (Even a couple of his rare incompletions were gorgeous throws.) Rosen’s second touchdown pass, a 30-yard, play-action lob to Thomas Duarte with former five-star recruit/future draft pick Quin Blanding running stride-for-stride in his hip pocket, was a work of art. The last time a freshman quarterback with this much advance billing looked this good in his first game was Jameis Winston’s flawless 2013 debut against Pitt, foreshadowing a season that would end with Winston hoisting both the Heisman and BCS championship trophies. Unlike Rosen, though, Winston was in his second campaign after redshirting the season prior. For an 18-year-old just a few months removed from high school graduation, Rosen looked so far ahead of schedule that it’s tempting to scrap the learning curve concerns altogether and declare him fully arrived. Forget potential: If the kid is capable of this kind of performance on a weekly basis, the Bruins can consider their most glaring question mark resolved, and the distance that separated them from Oregon and USC in the preseason Pac-12 pecking order effectively closed. The only negative was the unfortunate jersey style he was forced to wear in the process of winning over the skeptics. Now, I’m aware that, based on one over-the-top afternoon against mediocre opposition, hinting at runaway optimism requires a couple of caveats: You know, it’s one game; a single data point. Because passion for the sport always vastly exceeds evidence in the relevant sample size in a 12-game schedule, the college football hype machine is uniquely vulnerable to excess; it’s always advisable to remember past September Heisman winners such as Jacory Harris, Geno Smith, and especially Kenny Hill, who stole the show on opening night in 2014 only to find himself nailed to the bench by Halloween. While the distinction tends to be awarded retroactively, if there’s a candidate who clearly fits the September Heisman template right now, it’s Rosen. Still, given the expectations that preceded his first start and how emphatically he met them, for now it seems safe to assume that Rosen is at least as capable of sustaining the Bruins’ Pac-12 and playoff ambitions as, say, Vernon Adams is at Oregon. It’s probably also safe to assume that, as the season progresses and the degree of difficulty steepens in Pac-12 play, the Bruins will have to rely more heavily on the defense and ground game to keep those chances alive.1 But it’s much harder to argue now than it was on Saturday morning that Rosen’s age will necessarily prevent him from upholding his end of the bargain. If the question coming into the season was, “Can a true freshman quarterback emerge as an asset on a playoff-caliber team?” then there’s nothing more Rosen could have done to answer in the affirmative. Michael Weinreb: The first few weeks of the college football season are generally rife with surprises: Teams that were considered potential contenders wind up not being nearly as good as we thought they were, while teams presumed dead revise their prospects upward. The beauty of college football, after all, is that it is so inherently unpredictable, which is why what Alabama does at this time every year feels so militantly contrarian. Alabama is not a perfect team; Alabama is never a perfect team, but it’s the closest thing we have in college football to a sure thing. On AL.com’s list of “bad things” from the Wisconsin game, one was about the kicking game, one was about punter JK Scott, and a third was about the second-team defense allowing a touchdown; the only issue of substance was a critique of the Tide’s first-half pass defense, a problem they rectified completely in the second half. We spent the offseason telling ourselves that perhaps Wisconsin had a chance, that perhaps its physicality would overwhelm a still-developing Alabama team at a neutral site, that perhaps this would be the year the Tide would struggle through the SEC schedule. But as is always the case with Alabama, the Tide proved to be the constant in this bizarre and unpredictable equation. It’s Year 2, the face said, and we can’t tackle somebody named C.J. Prosise. I don’t know many Texas fans who thought the Longhorns could beat Notre Dame in South Bend. I know a bunch — me included — who were hoping for ye olde moral victory, like the one Michigan fans were claiming after Thursday’s loss to Utah. You know, the kind of loss that leads to an eight-win season while national writers forget about you. We didn’t get it. Not even close. We got a 38-3 loss thanks in part to a quarterback situation that’s been a national crisis since late in Mack Brown’s tenure. We’ve entered a phase when a new coaching staff is doubling down on Brown’s recruits — namely, Tyrone Swoopes, who played most of the game over freshman Jerrod Heard. Swoopes was 7-for-22 for 93 yards. Since this is how people talk about Texas now, we must inform you that, in 2013, the Longhorns took Swoopes over J.T. Barrett. Most of the rest wasn’t his fault. Really, the most entertaining part of Saturday’s game was watching Texas exes emote on Twitter. Remember James Kirkendoll? Texas' offense looking about as useful as my last 4 rounds…. It was only Week 1. Yet we’ve already moved to the part of the season when Texas disappears into the weeds of major college football, resurfacing every few weeks for a “what happened?” think piece. By year’s end, the defense could be very young and very good. The offense could be … give me a few weeks to find the right metaphor. And by the way: Notre Dame could be really good. Hinton: On the opposite end of the spectrum from Rosen, there was Auburn quarterback Jeremy Johnson, whose highly anticipated debut as the Tigers’ full-time starter left much to be desired in a 31-24 win over Louisville. On one hand, a win over a respectable ACC opponent is a win over a respectable ACC opponent, and Johnson showed several flashes of the talent that sent his preseason Heisman stock soaring over the summer.3 Taken as a whole, though, the overriding themes of his performance were inaccuracy and inefficiency: Only two of Johnson’s 11 completions covered more than 18 yards, and his three interceptions tied for the second most of any FBS passer this weekend. His passer rating (94.3) ranked outside the top 100, a dramatic plunge for an attack that led the SEC last year in pass efficiency. And for a guy whose own coach compared him to Cam Newton, Johnson was surprisingly absent as a rusher, managing just 11 yards. “I think [Johnson] was trying to force a few things, just trying to make some plays early on,” coach Gus Malzahn said. “He’s going to be fine.” Maybe so. Probably so. Still, Auburn’s final output in terms of offensive plays (62) and total yards (327) barely eclipsed Malzahn-era lows in both categories, and if not for a crucial defensive touchdown in the first half, the grading curve for the offense may not have been as forgiving. The Tigers have one more nonconference scrimmage on deck, against Jacksonville State, before they need it all to come together for the start of SEC play against LSU and Mississippi State. Chris B. Brown: When discussing modern spread offenses, Saban has been a notable curmudgeon, questioning whether such attacks undermine the game’s fundamental “fairness.” He’s even supported a measure (which Steve Spurrier dubbed the “Saban rule”) that would penalize teams for snapping the ball too quickly. The old defensive guru clearly feels that the game is changing — and not for the better. But Saban also likes winning, and after troubling losses to Texas A&M in 2012, Auburn in 2013, and Ohio State in 2014 — plus limited sympathy for his public complaints — it appears that he’s settled on an “If you can’t beat ’em, join ’em” approach. Alabama’s offensive transformation began two years ago and took a big step forward last season under new offensive coordinator Lane Kiffin, with the Crimson Tide setting school records in numerous categories. But the Tide’s Week 1 win over Wisconsin was the best evidence yet that Saban is a spread offense convert in practice, if not entirely in spirit. That’s modern spread offense stuff all the way.5 Saban the defensive coach might not like uptempo spread offenses, but Saban the head coach appears more than willing to let his team run one. Holly Anderson: An opening week that started with FIU beating UCF, Western Kentucky defeating Vanderbilt, and Fordham beating Army on Thursday continued to delight those of us who bask in the sight of smaller schools getting salty throughout the weekend. There’s something spitefully poetic about watching a team that’s being paid (in some cases) hundreds of thousands of dollars to take a road trip and lose a football game forget that it’s not paid to make things exciting. And on the first Saturday of the season, that forgetfulness ran rampant. Kansas is in such a state as a program that the fact the Jayhawks looked like they might beat South Dakota State was news for a few minutes. Portland State knocked off Washington State in Pullman, prompting the CougCenter blog to issue the following breaking news banner: “THERE IS NO FLOOR.” (Sunday morning it read, “THINGS ARE BAD.”) Newcomers Charlotte and Old Dominion dispatched with FBS dregs Georgia State and Eastern Michigan. North Dakota went into Laramie and walked away with a small souvenir strip of Wyoming’s hide. And there were too many close calls to even get into in this small space, enough to make you wonder whether in a way, body-bag games might be a semantic lose-lose for the teams writing the checks. A win over FCS Directional State is a win, and woe betide you if the margin of victory isn’t fat and sassy; a loss will haunt your squad for at least the season, and sometimes for years to come. But the real showstopper of Week 1, with little argument, was Temple’s 27-10 victory over Penn State, the program’s first since 1941. Many a motivational poster will be made (TENple, anyone?) of the Owls’ double-digit sacks tally; many a clip of a beleaguered Christian Hackenberg, running for his professional life behind a Nittany Lions offensive line so insubstantial that “behind” doesn’t even feel like the right preposition to use, will be looped to “You Had a Bad Day.” But the sour cherry on this Saturday sundae was what appeared to be a sideline argument over PSI. Just when you thought you couldn’t get LESS interested in deflated footballs, James Franklin starts to care about them. Hooty hoo! Mallory Rubin: Those of us lacking conveniently short memories would do well not to overreact to Texas A&M’s 38-17 win over no. 15 Arizona State, because it was just a year ago that the Aggies lit the world on fire in the opener only to drop five of their last seven regular-season games. But I confess that it’s once again proving hard to resist the Aggies’ charms. Quarterbacks Kyle Allen and Kyler Murray, the top QB prospects in the class of 2014 and ’15, respectively, both saw action and showed flashes of brilliance on Saturday. True freshman receiver Christian Kirk returned a punt 79 yards for a touchdown and caught a 66-yard score on a late bubble screen. Junior safety Justin Evans totaled nine tackles and disrupted ASU’s passing attack all night. And they were all outplayed by sophomore defensive end Myles Garrett, who looked positively Clowneyesque6 against the Sun Devils. Garrett racked up two sacks, a forced fumble, eight tackles, 2.5 tackles for loss, and three QB hurries, making his opponents seem as hilariously minuscule as any regular person who stands next to the 6-5, 260-pound human abdominal muscle. I’m sure the A&M administration did plenty to make former LSU defensive coordinator John Chavis feel welcome upon his arrival to College Station, but it’s hard to think of a better housewarming present than Garrett, who’s capable of delivering the kind of exceedingly rare season that earns a defender a trip to New York City. 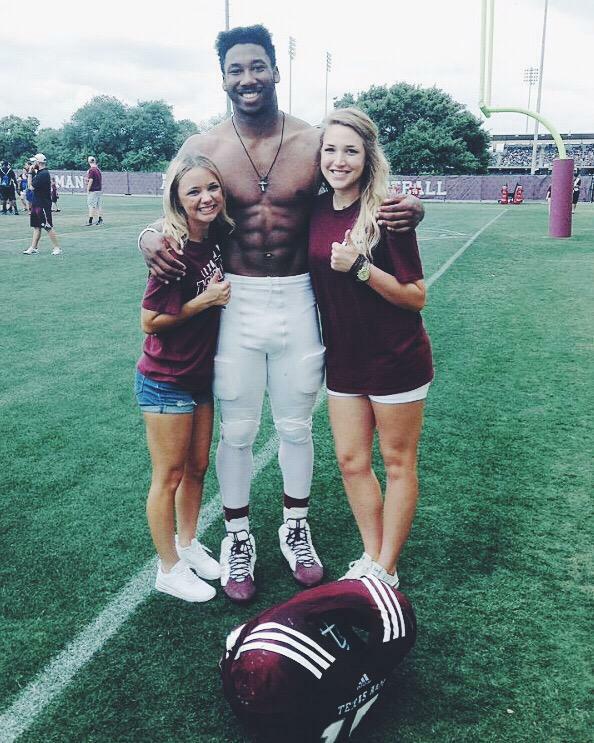 I’m not quite convinced that Myles Garrett is human. I mean, I understand that machines can’t enroll in college, but he make me question it. For the Cougars, the stark reality of Hill’s injury will set in soon enough, with tough matchups looming against Boise State and UCLA. The 25-year-old senior was a legitimate Heisman contender, while Mangum is an inexperienced (if highly touted) freshman. Inevitably, there’s going to be some growing pains for Mangum — who was serving a mission in Chile just three months ago — but now’s not the time to worry about that. It’s the time to run around like a madman and hug anyone in sight. Brown: Though Hal Mumme was the original force behind the vaunted Air Raid offense and Mike Leach his pupil at Iowa Wesleyan, Valdosta State, and Kentucky, Mumme’s teams never won more than seven games in an FBS season, and he posted an 11-38 record in four seasons at New Mexico State. Leach, meanwhile, delivered an 84-43 record at Texas Tech and led his team to 10 straight bowl games.7 Part of the reason that Mumme’s record was less glowing was that he was happiest trying to turn around downtrodden programs. He failed at New Mexico State, but he returned several schools to the postseason, including Kentucky. Washington State was supposed to be Leach’s reclamation project — both for the program and for himself following an ugly divorce from Texas Tech. When WSU hired Leach in the fall of 2011, I was thrilled: Yes, Leach is a fan (and media) favorite, and yes, his teams throw a lot, but learning the intricacies of his Air Raid offense was in many ways my graduate school in football strategy. Many of his ideas regarding scheme and how to organize and practice offense have shaped the thinking of an enormous number of coaches at every level of football, and I was excited to see his offense back on the field. But rebuilding Wazzu was never going to be easy, and some warning signs appeared early in Leach’s regime: Upon arriving in Pullman, Leach seemed more hell-bent than ever on throwing the ball nonstop, and despite all of his Air Raid protégés refocusing on running as well as throwing, the Cougars have finished dead last nationally in rushing for each of the past three seasons. Leach’s staff has also seemed to be in constant upheaval, with a revolving door of assistant coaches. Perhaps most alarmingly of all, Leach has seemed less an idiosyncratic football coach and more the character of “Mike Leach” — a caricature of the coach portrayed on 60 Minutes, in the New York Times, and in countless breathless profiles. Leach’s scattershot interests are part of his charm, and the early expectations for his WSU success may have been unrealistic, but regardless: Something has seemingly been missing since the start of his Cougars tenure. That feeling was amplified considerably this weekend when Washington State, a 31-point favorite, dropped its season opener 24-17 to a Portland State team that finished 11th in the Big Sky Conference last season and still has an interim head coach. Now, Leach’s reclamation project seems less likely to succeed than ever. He probably isn’t going anywhere anytime soon, as firing him at the end of this season would cost WSU almost $5 million, but unless something changes fast, Washington State will be someone else’s rebuilding project before long. Borcas: Say this much for Bowling Green: The Falcons made their presence felt in Nashville this weekend. Not necessarily on the scoreboard, where the Volunteers predictably dismantled their opponent, 59-30 — but in the hearts and minds of anyone who bothered to watch this glorious, orange-hued clash. #Vols-Bowling Green ref just had hot-mic moment: “DUDE, YOU BETTER SHUT YOUR MOUTH AND GET IN THE (EFFIN’) HUDDLE!" Amazingly, though, this was far from the game’s most ridiculous moment. Back in the first quarter, Falcons defensive lineman Mike Minns — whom I presume is a theater major — lost his shoe while attempting to run off the field, and promptly played dead. Incredibly, Minns’s flop-tastic strategy worked: He was allowed to leave the field without drawing a penalty, because there was no way to prove he was faking. The Tennessee faithful were not pleased with the performance, all but pelting him with rotten tomatoes as he was helped to the sideline. Forget about the Heisman; give this man an EGOT! Riley McAtee: I’m as guilty as anyone of forgetting that special teams exist. Unless Adoree’ Jackson is back to return, I consider punts and kickoffs the perfect time for a bathroom break or beer run. But on Friday night against Boise State, Washington reminded everyone how crucial special teams can be. This game had all the makings of a blowout, with the Broncos nearly doubling the Huskies’ yardage, possessing the ball for almost nine more minutes, and leading from wire to wire. The Washington offense, which netted just 4.3 yards per pass and an abhorrent 1.3 yards per rush, was so bad that calling it stagnant would be an insult to pond water. The Broncos led 16-0 at halftime and looked poised to serve their former head coach a 30-plus point loss. Yet the Huskies managed to narrow Boise’s final margin of victory to 16-13, pulling within three late in the fourth quarter and securing a chance to tie the game with less than two minutes remaining. That didn’t happen thanks to a glut of turnovers or a sudden offensive resurgence, but rather because of that often boring and unremarkable part of football: special teams. Down 16-3 late in the third quarter, the Huskies finally got an injection of life when sophomore receiver Dante Pettis took a punt 76 yards for a touchdown. He started with two Broncos in his face before whipping to his right, taking advantage of two perfectly timed blocks to walk almost untouched into the end zone. A few possessions later, the Broncos lined up to punt again, but it was blocked by Jaydon Mickens, setting up the Huskies at Boise State’s 27-yard line. The Washington offense predictably sputtered on the next drive and the Huskies leaned on their kicker, Cameron Van Winkle, to launch a relatively easy 28-yarder through the uprights to cut the deficit to three with seven minutes left. Van Winkle, one of the most reliable kickers in the conference, almost sent the game into overtime. Forty-six yards is out of range for a lot of #collegekickers, but Van Winkle, who has a career long of 51, was well within his striking distance. But Washington’s special-teams magic finally ran out. Van Winkle pushed it wide right, and Boise State avoided collapse. Even though the comeback bid fell short, the lesson was clear: A game in which Washington was outgained by 158 yards came down to a couple of feet. Washington nearly tied it up without any crazy turnovers, amazing trick plays, or fortunate bounces. The Huskies looked awful, but still had a chance to beat a better team in classic Chris Petersen fashion thanks to a handful of plays on special teams. Anderson: First, a quick review of what we knew heading into Georgia Southern’s season-opening trip to West Virginia: We knew that GSU is something of an FBS enfant terrible, more than happy to take the money and run, and run, and run. We knew this seemed like a really bad idea for a Week 1 warm-up contest. We knew the Eagles’ starting quarterback would be serving the first half of a two-game academic suspension Saturday night, but that these Eagles prefer to keep the ball on the ground, having averaged fewer than 13 pass attempts per game in 2014. We knew the game was in Morgantown, at night, and had heard rumblings that the Mountaineers defense, under young-gun DC Tony Gibson, was showing real promise in the offseason. None of this knowledge was proper spiritual preparation for what happened in the third quarter of WVU’s 44-0 win, when three of Favian Upshaw’s 13 passes on the night (way to hit that average!) found their merry way into the hands of the exact same West Virginia safety, senior captain Karl Joseph. With all due sympathy to the intricacies of coaching offense, at what point following the second pick by the same player does a staff maybe decide to try not putting the football where Joseph might be able to get it? He’s even got his name written in capital letters on his shirt, and a number assigned to his person, for easy location on the field. GRAPE JOB. Relying on the defense will be considerably tougher in light of Sunday’s news that star defensive lineman Eddie Vanderdoes will miss the rest of the season with a torn ACL. The one exception: Last year, when the Tide beat an unranked West Virginia team to start the year. A long touchdown pass that was negated by penalty led the highlights. The bubble screen and hitch are pre-snap decisions, while the decision to hand off or throw to the tight end happens after the snap. Including the center arguably being illegally downfield when the ball was thrown. High school and college Clowney, not pro Clowney. Obviously. He didn’t coach the 10th bowl game, having been fired prior to the game.